Amatrol’s Wound Rotor Motor Learning System (85-MT2D) covers the function, operation, and performance characteristics of wound rotor motors. While VFDs and standard induction motors have replaced wound rotor motors in many applications, these motors are still used for heavy-duty, high torque applications such as industrial cranes and hoists. Wound rotor motor training requires Basic Electric Machines (85-MT2) and DC Generators (85-MT2B) for use. Wound rotor motor training includes a wound rotor speed controller, a wound rotor motor, banana leads, in-depth multimedia curriculum, an installation guide, and a student reference guide. These components will be used to study topics such as wound rotor speed control, performance characteristics, and motor reversing. Amatrol systems feature real-world, industrial-grade components for both durability and to facilitate learners in gaining hands-on practice with actual equipment that they’ll find in the field. 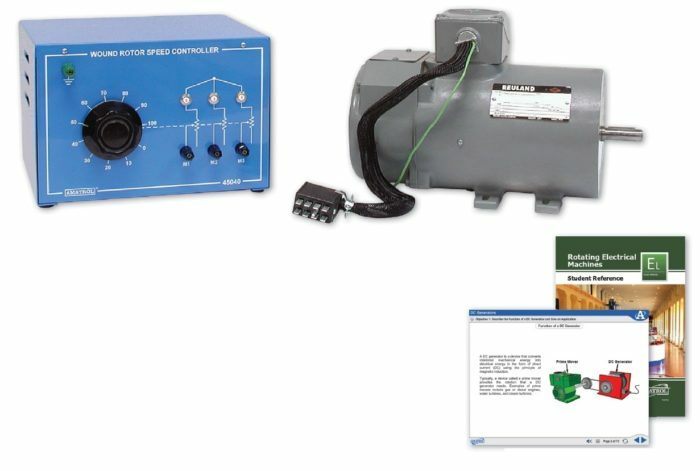 Wound rotor motor training includes a wound rotor speed controller with a three-phase rheostat and three 5-amp circuit breakers, a 1/3 Hp wound rotor motor, and a banana lead set. These industrial components will be used in conjunction with basic electrical machines training and DC generators training to build hands-on skills such as connecting and operating a wound rotor motor and motor speed controller, measuring motor performance characteristics, and reversing the rotation of a wound rotor motor. This industrial motor training’s curriculum dives into topics like the wound rotor motors function and operation, the function of a speed controller, the speed and torque characteristics of a motor, and learning how to reverse a motor. Amatrol provides this curriculum in a stunning interactive multimedia format that includes 3D graphics, audio voiceovers, and interactive quizzes and activities. In addition to wound rotor motors training and the required DC generators training , the Basic Electrical Machines System (85-MT2) features another option to expand electrical machine skill-building: Alternators / Synchronous Motors (85-MT2C). The alternators and synchronous motors training system includes capacitive load, combination synchronous motor/ alternator, and synchronizing lights / switch unit to teach alternators and synchronous motors commonly found in industrial applications. A sample copy of the Rotating Electrical Machines Student Reference Guide is also included with the system for your evaluation. Sourced from the system’s curriculum, the Student Reference Guide takes the entire series’ technical content contained in the learning objectives and combines them into one perfectly-bound book. Student Reference Guides supplement this course by providing a condensed, inexpensive reference tool that learners will find invaluable once they finish their training making it the perfect course takeaway.